What Ruggles refers to as the “corporate family” (families with self-employed married men, except for those with wives who had an occupation outside the family business, most of which had family farms) predominated for hundreds of years before. 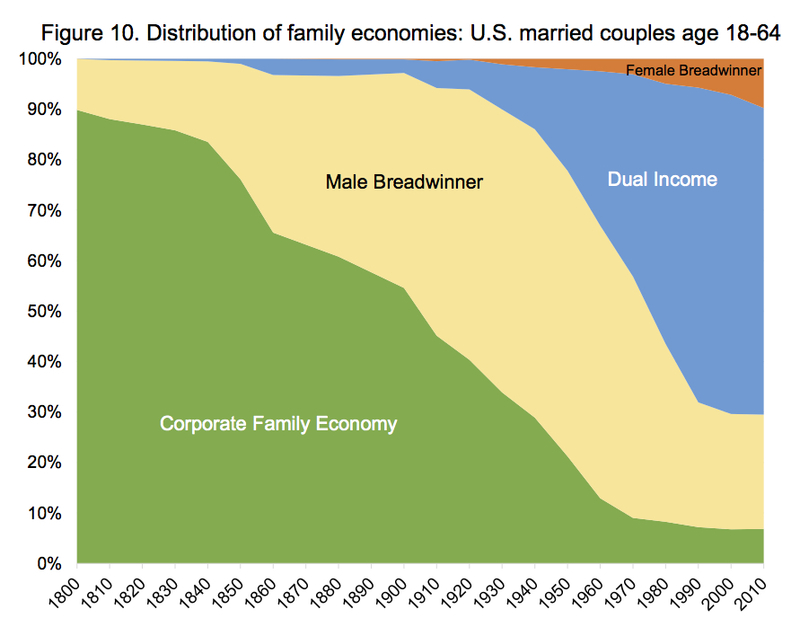 The male breadwinner category (in which the husband worked outside the home and the wife had no occupation listed)—the kind of household celebrated most famously by Gary Becker (in his 1981 Treatise on the Family)—represented a majority of marriages for just five decades—from 1920 to 1960—reaching a peak of 57 percent in 1940. Dual-earner families have now predominated for almost a half century. Over the past several decades, female-breadwinner families have emerged as a significant new form, and now account for a tenth of all marriages. The transitions from corporate families to male breadwinner families to dual earner families resulted from largely exogenous changes in labor markets. In the mid-nineteenth century, there were few alternatives to family labor. . .There were relatively few wage-labor jobs available, and about half of them were unskilled laborers, who generally did not make enough money to start a family. There were as yet few factory jobs; in the skilled workers and operatives category, the most important jobs were miners, sailors, machinists, and overseers of slaves. Wage-labor opportunities were far worse for mid-nineteenth century women than they were for men. The only significant category of female wage-labor employment was unskilled work, which almost exclusively meant work as domestic servants. Self-employment opportunities were also limited; most self-employed women were seamstresses or launderers. The tiny professional and managerial category—accounting for less than 1% of adult women in the mid-19th century— consisted almost entirely of teachers, who were rarely paid a living wage. The best jobs available for women were the 1.3% in the skilled worker/operative category; these were factory workers, and four-fifths of them were located in New England and the Mid-Atlantic states. New England was the best place to be a wage worker, since it had the most advanced industrial sector and labor was in short supply; in the mid-19th century, New England had one of the best- paid workforces in the world. Even there, however, it was difficult to make enough money as a wage worker to live on, much less support a family. The number of factory jobs grew rapidly; there were only a handful of mills in 1825, but by 1850 there were over a million manufacturing workers, and there were six million by 1900. In the late 19th century clerical jobs for men also grew rapidly, followed by professional and managerial positions in the early 20th century. The growth of well-paid wage labor job opportunities for men undermined the economic underpinnings of patriarchal authority. Once sons had the option of leaving home for the high wages and independence of town life, they had little reason to remain at home under the control of their fathers. By 1910, the number of male-breadwinner families exceeded the number of corporate families, and the percentage continued to grow until World War II. The post-war boom in demand for wage labor accelerated the shift away from corporate families, but the percentage of male-breadwinner families began to decline rapidly as the dual-earner marriages grew explosively. Women made considerably less than men, and at first their wages rose more slowly, so the gender gap in wages expanded from 1940 until the mid-1970s. Nevertheless, median full-time wages for women age 25-29 rose dramatically, from $13,500 in 1940 to $37,600 in 1974 as the percentage of women working full-time increased from 25% to 40%. When we look at all men and women. . .women do not register until 1968, since that was the first year that more than half of 25-29 year-old women were in the wage labor force. Dissatisfaction of women with the male breadwinner system helped to fuel the supply of married women’s employment. The desperate boredom of housewives Freidan described was compounded by technological and demographic change. The increasing use of labor-saving household devices—especially washing machines—together with parity-specific fertility limitation, meant that women in male-breadwinner families had more available time in the second half of the twentieth century than in the first half. As married women flooded into the paid workforce, the stigma that had surrounded married women’s participation in wage labor quickly disappeared.